Metynnis argenteus common name silver dollar. They can grow up to 15-16 cm / 6 inches fully grown. They are best kept in water parameters of PH range 6.0-7.5, and temperatures of 22-26 Celsius / 72-79 °F. Silver dollars are not an aggressive fish, but how big they can get it is best to keep them with medium up to bigger size fish. They do race about the tank and can knock other fish out the way, so abig tank is best for the dollars. They can be shy on there own, so mixing them in small groups, or just as a pair will keep them happier. They will eat any foods you put in the tank for them, like flakes, pellet, and granular foods. They do need a treat of frozen or live blood worm and brine shrimp. 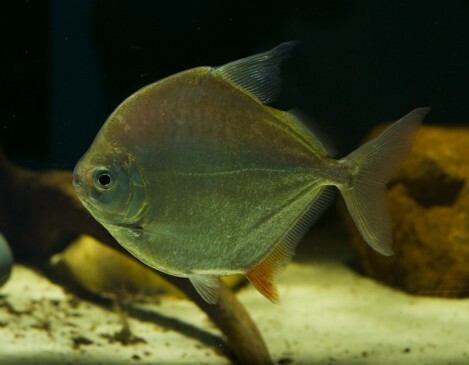 The silver dollars love plants, you will find keeping live plants can be difficult with these fish. Silver dollar can get to a nice large size but they still only have small mouths, they will still try to eat any food you put in the tank for them even though it does not fit in there mouths. They do require live or frozen foods to keep them healthy and happy.